It's my first summer at Pear Tree Cottage (what I'm calling my new home), and I'm still discovering what's here in the garden. Despite it appearing to be a completely blank slate, there is still a fair amount of life here, despite the previous owners' best efforts. Wandering through the garden today, I found equal measures of things I found and things I brought. The pink peony above is something I brought with me, along with several other peonies. This one is a Sarah Bernhardt peony (Paeonia 'Sarah Bernhardt'), one of my favorites. I found another favorite flower lurking in my back yard by the fence, this dramatic white calla lily (Zantedeschia aethiopica). I really love these, and I feel lucky to have them in my garden. But I'm going to have to find a different spot for them, because the dog keeps trampling this spot trying to say hello to the neighbor! 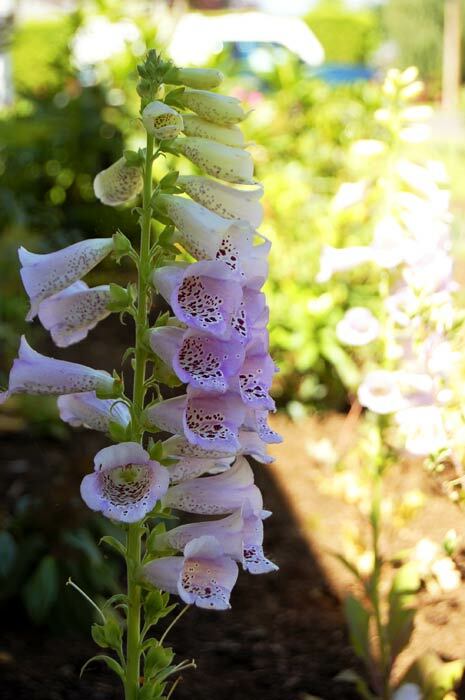 The foxgloves (Digitalis purpurea) I bought this year at the garden center. I didn't have a chance to bring any with me. These turned out to be fairly pale. I'm hoping they'll seed and some darker purple ones will come up next year. There are parts of my backyard that have some "secret garden" potential, like this one. There's an enormous clematis growing on the fence--the biggest one I've ever seen. The neighor has an arched trellis there that it grows on also, so we trained it to leave a little porthole. I have a soft spot in my heart for prairie flowers like this rose campion (Lychnis coronaria), so I had to bring some with me. Another new discovery is this mystery rose on the back fence. It's not a rootstock rose, those are a darker red. So someone planted this on purpose, but neither I nor my neighbor know who. It's pretty, though, and surprisingly healthy and floriferous considering it is growing in the shade of an Ash tree and an arborvitae hedge. It doesn't have a tag, but it does look kind of like this photo of Blaze climbing rose (Rosa 'Blaze') I found, what do you think? How about you? Were you surprised by any of your June blooms? This post is a part of the Garden Bloggers Bloom Day for June 2008, sponsored each month by May Dreams Gardens.